(CNN) - Mitt Romney's team released perhaps its most thorough response yet to attacks against the GOP candidate's business record, unveiling a new website Thursday that highlights his career as a private equity executive. 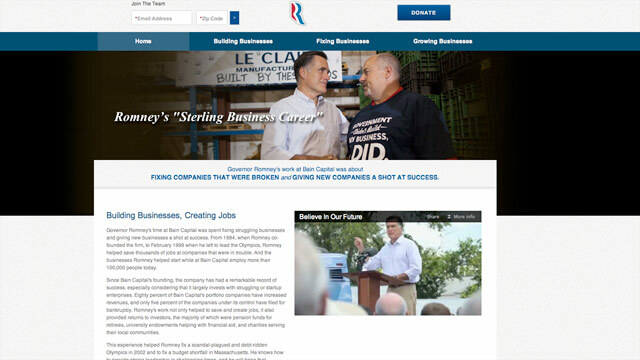 The website, www.sterlingbusinesscareer.com, was debuted just hours before Romney is set to take the stage at the Republican National Convention and accept his party's nomination for president. While the candidate frequently touts his business experience as a calling card on the campaign trail, he rarely brings up his former private equity firm, Bain Capital, by name or talks at length about his role at the company. He does, however, frequently mention Bain's success stories, including helping form Staples and Dominos. "Governor Romney's time at Bain Capital was spent fixing struggling businesses and giving new businesses a shot at success," the website says. "From 1984, when Romney co-founded the firm, to February 1999 when he left to lead the Olympics, Romney helped save thousands of jobs at companies that were in trouble. And the businesses Romney helped start while at Bain Capital employ more than 100,000 people today." Campaign officials have said Romney will talk about his corporate career in his highly-anticipated speech Thursday, which follows a program focused on a biographical theme. One portion of the evening's schedule particularly hones in on Romney's business experience. Bob White, chairman of the campaign and a close friend of Romney, will talk about Romney's business experience. Tom Stemberg, founder of Staples who worked closely with Romney on the company's development, will also speak. The new website offers testimonials from former colleagues and features profiles on businesses that Bain helped "grow" or "fix." It also has a section for businesses Romney helped "build," which specifically highlights Staples and Steel Dynamics. Each business has its own section on the site, complete with text and video describing Bain's involvement with the company. The title of the website comes from a quote from former President Bill Clinton, who took heat from fellow Democrats when he said Romney had a "sterling business career" in a May interview with CNN's Piers Morgan. President Barack Obama's re-election team and allies have made Romney's corporate history a major target in their campaign. Seeking to define Romney shortly after he became the all-but-certain GOP nominee in April, Team Obama quickly pounced on the candidate's private equity past, releasing ad after ad that painted the candidate as a greedy businessman. Democrats especially railed the former Massachusetts governor over some of the firms that ultimately went bankrupt after Bain loaded them up with debt as part of a leveraged buyout. A pro-Obama super PAC, Priorities USA Action, spent $20 million this summer on television ads that featured laid off workers from these shuttered business. Romney repeatedly responded to the attacks, saying he does not apologize for his success and criticized Obama's campaign for trying to distract voters from his administration's "failed" economic policies. Bain Capital, for its part, responded to the ads by pointing to its successes, saying 80% of their 350 companies and 100 start-up investments grew as a result of Bain investments. The new "sterling" website also cites a similar statistic, adding "only five percent of the companies under its control have filed for bankruptcy." How does he reconcile this? That is all just 100,000.00 jobs were created in that time frame? How many did he ship overseas? Read between the lines people. Romneyhood and his supporters are scam artists. Alt least President Obama created 4,000,000,00 jobs in 31/2 years. Please put Mittens back into the toy box. No one wants to play with him anymore. Sterling job at shipping dismantled corporations overseas,sterling at destroying employees lives.Sterling with stealing healthcare,pension plans,peoples futures..And his Sports Authority,Staples,Dominoes Pizza sucess claim rings lies as well with Bain selling off to other venture groups,public equity firms that did restructure these corporations and made them viable in business again,quit lying Romney you're stepping on your tongue again.And you did create thousands of jobs too while at Bain ,too bad it was overseas.Gas up the jet,you're going on a long trip after the debates,hope you have your foriegn account numbers ready for cash,you'll need it!! I want to know how much the Republicans pay for their generous healthcare per month and also if Obama care is so costly why don't we cut the care they get that is paid by the tax payers to start and make them go out and get private insurance and pay for it themselves. Also they can see how hard it is with pre-existing conditions, rotten benefits etc. Also with their proposed plan, how will they get insurance or just keep having the tax payers pay their way to cut out the rest of us? Your not worth over $200M with no inhertance (he gave it away) unless you are pretty d@mn good at your job. As far was private equity experience what he has is C level experience. Obama had experience with a bull horn and doe eyed law students hanging on to his every thought. You have to manage people effectively to be a chief executive whether in governement or business. It is possible to streamline government partly by not hiring replacements for retirees and I guarantee you Romney has ideas for every scenario. He's neglected to mention anything so far about his Bain days. Now he wants to defend it. Too many secrets Mitt. The part about his success stories on how he strengthen the economies in countries like China and India by outsourcing American jobs to take advantage of cheap labor will be left out of his speech. The ad with Joe Soptic never did make it on the air because it was a lie. Bain Capital employees donated money to the Obama campaign, so a few 1000 or more employees work for the companies Bain Capital owns. Jonathan Lavine, Obama's friend, campaign contributor also worked for Bain, oh yes, he replaced Romney when Romney left in 1999 thus making Lavine responsible for firing Joe Soptic, I would think Stephanie Cutter would have known that detail. Bottom line, the guy has an excellent record but Democrats won't hear of it, even those Democrats that work for Bain Capital companies. "Sterling" business record? It's not sterling, it's just badly tarnished brass. Do you know where Obama created 4,000,000.00 jobs???? Name the companies. Too little too late Romney. Show us your taxes like every candidate for President has for over 4 decades. happened thereafter. But in his 2010 tax returns he deducted half of a million for bain services. Romney laid off workers, bankrupted companies, and shipped American jobs overseas. There is nothing sterling about that. Creator of minimum wage jobs and destroyer of middle-class income employment. Does it matter. At best Mitts leaves Tampa with only 3-5 point lead in the polls that will quickly vanish after the Democratic Convention next week. This will come down to the debates between Obama & Romney. Obama has already shown that he is a skillful debater while Romney has come off stiff and awkward. If he falters in the debates, kiss the election good bye. What sterling business record? He won't talk about bain (loss of American jobs, bankrupted companies, closed plants, lost pensions) so what's so stellar about silence? Even without Hurricane Isaac taking the wind out of the teapublikkklan sails there is absolutely no interest in this man and his boy toy. At work they have MSNBC on during the day. People have been going outside this week so as not to have to listen to the crap about the rnc convention in ta ta land, ooops Tampa. Well of course, that is the IRS law. And you guys wonder why Romney won't release more taxes???? You can't even read the one from 2010 and you don't even care to know the IRS laws. George W. Bush was a businessman was he not ? How is that 10 TRILLION ( not including the two wars OFF the books ) in debt – 2001- 2008 – working out for ya tax bill ? If you can do simple math, he had a surplus from Clinton. Conservatives claim the President had spent 5 trillion,but forget TARP was drafted by bush and Obama put the TRUE costs of the two wars on the books. Thats got to be 2-3 Trillion. If I'm lying PROVE it. And, that's his calling....to be a businessman. He is not presidential material. Nice guy, but not cut out to be a politician and it shows. Unfortunately, POTUS requires a politician. Romney's already made all the wrong mistakes from flip-flop-flip, to buddying up to big money and big business. He doesn't quite get it yet that the president is elected and that there are far more voters who are not millionaires than there are who are millionaires. He won't win. Period. A true leader acknowledges his or her failures as well as his or her successes. Anything else is just more dishonest corporate PR and spin. Has Mitt Romney ever said anything about his role in the companies that failed, or the ones that he bought just to load with debt and then take into bankruptcy, or to split up and sell at a profit? Does he have any regrets at all about ruining peoples' lives and careers? Does he feel any remorse about the tactics he used, which were very common at the time? As a former insider would he now propose reforms to prevent some of the more egregious abuses and outcomes? Or does he think that the ends justify the means, and the wealth he and his employees amassed justify everything they did? Does Mitt Romney have a conscience, or just a very large bank account, spread over several low tax countries? Somehow I don't think this website will answer my questions, any more than a Coke website would mention that there's a whole world of colas out there. But then Coke isn't trying to be my President. Romney's wife says he's not the type of person who likes to talk about himself but that's a lie because Romney enjoys talking about himself, he just doesn't like telling the truth about himself.